Based on the popular video game series which features a platoon of worms blasting things up with the increasingly peculiar armaments. 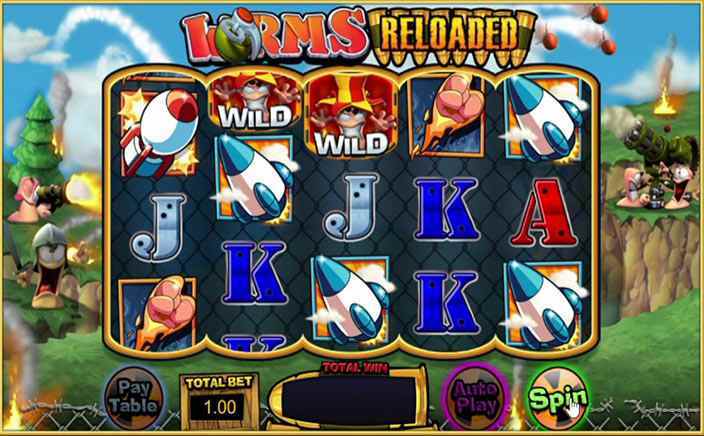 Worms Reloaded slots is the anarchic 5 reels, 20 paylines game launched by Blueprint Gaming software. Just like its original Worms game, its sequel is also fully packed with lots of crazy features which offers a good chance of creating some big wins during the gameplay. This slot comes with an RTP of 95.04%. Load Some Exciting Prizes In Worms Reloaded Slots! Visually, the icons are well-crafted and include a blue game’s logo, red rockets, a flying fist and a shotgun as a high-value icon; whereas the lower value symbols consist of traditional playing cards (i.e. J, Q, K and A). The wild icon in Worms Reloaded slots is a worm wearing a jester’s hat and it can replace all other icons on the reels and help with the forming of winning combos. The only symbol on the reels that this wild icon cannot replace is a worm bonus icon. This slot game has an exciting progressive jackpot which is entertaining as well as rewarding for slot players. You can play this slot with a minimum betting value of 20p to a maximum value of £500.00 per spin. This is a frequently occurring bonus feature which is embarked by a Worms Grenade which explodes the game’s logo and ends up triggering one of following feature: Banana Bomb Wilds, Holy Hand Grenade, Teleport Mayhem or Concrete Donkey. Battleground Bonus– this is a type of pick me round. Pick from the selection of mines to reveal cash prizes as well as a collect or trigger one of the other bonus features available.Jet Pack Bonus– select a UFO that will help players to progress through the cash trail. Players should land on the wormhole in order to make a fast progress along with prizes to match. Players can also win up to 1,000 times their staked sum. Blitz Free Spins– the free spins feature takes place on a new set of reels and features a cameo appearance from the worm strapped to a rocket and this can give out multipliers if the worm icon lands on reel 5. Players can boost their winnings by up to 5x their stake amount. Super Sheep Free Spins– players are awarded six free spins. The wrinkle will come with a Super Sheep which may add some extra wilds to the reels on every free spin. After the last free spin players are shown a trio of the grenades – choose 1 for revealing a collect that ends this feature or the re-trigger which awards you with a further chance to earn free spins. 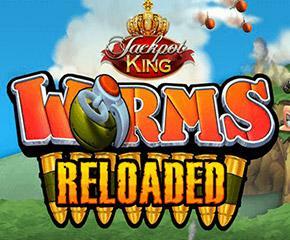 Worms Reloaded slots have exciting bonus features along with a progressive jackpot which offers a hefty amount to slot players. It also has a moderate variance and one can earn a maximum amount of 500 coins during the gameplay.